Recently a partner in a major accountancy company told Stan Curtis that he had made a lot manufacturers a lot of money over the years. Now the opportunity exists for your company to join that league of sucess stories. Stan Curtis built his career designing and marketing some of the most advanced and commercially successful consumer electronic products, ranging from CD players and loudspeakers, to DVD players and LCD televisions. 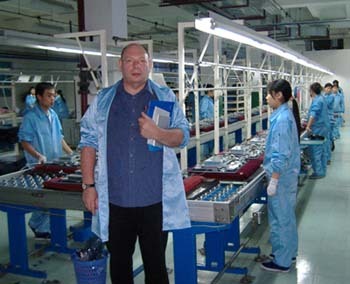 By the late 1990s Stan was Chairman of IAG Limited, a company for which he raised the finance and formed with two Chinese businessmen, and for which he acquired and grew some of the leading hi-fi brands – increasing worldwide sales and moving manufacturing to China in a way which was both acceptable to the market and also improved the company's profitability and efficiency without in any way compromising the core values of the brands – brands that included the iconic Wharfedale and Quad names. He has a wealth of commercial and technical expertise, including a special talent for helping companies develop a sucessful strategy for moving their businesses forward. Today Stan Curtis undertakes a very limited amount of consultancy work for those companies who value innovation, experience and a belief in business sucess. Strategic advice - if you have the vision for your business, but not the route map, discussion with Stan will enable you to identify your priorities and the steps you need to take to get your business moving in the right direction. Stan will meet with you for a one-off discussion and, if required, follow-up meetings to monitor your progress and help you to identify opportunities and threats - and how to deal with them effectively. Product planning - identifying real market opportunities and the products that will satisfy them is your job. Analysing the cost structure, production cycle, marketing plan and setting up a workable distribution channel to ensure that the business works - Stan can help you with this and much more. Product design - Stan has been consistently "ahead of the curve" when it comes to new product concepts and then designing exciting products which appeal to consumers and which depress the competition. Maybe it's time to add some of the "Stan Curtis Magic" to your next offerings. Business planning - nationally or internationally, with experience living and working in countries as diverse as the USA and China, Stan Curtis can help you to take your growing company to the next level; or look at your existing company to see how it can have a future. Whether your problem is too much or too little success; or how to get to the next stage, Stan has the experience to understand your problems and turn them into exciting challenges to be won. If you have a design or business project that needs this special kind of input contact Stan Curtis at the email address below.